Today is the feast of Saint Paul the Hermit, father of hermits, who had St. Jerome for his historian. Having become an orphan at the age of fifteen, he gave up his possessions and retired into a desert where a flourishing palm-tree, a symbol of is virtues (Introit) provided him with food and clothing. He meditated in solitude on the science of sciences which is to know Jesus Christ (Epistle) and the Father Whom Christ reveals to the humble (Gospel). He lived thus to the age of 112, enjoying in the heroic exercise of prayer and penance the sweetness of the Lord’s yoke (ibid). 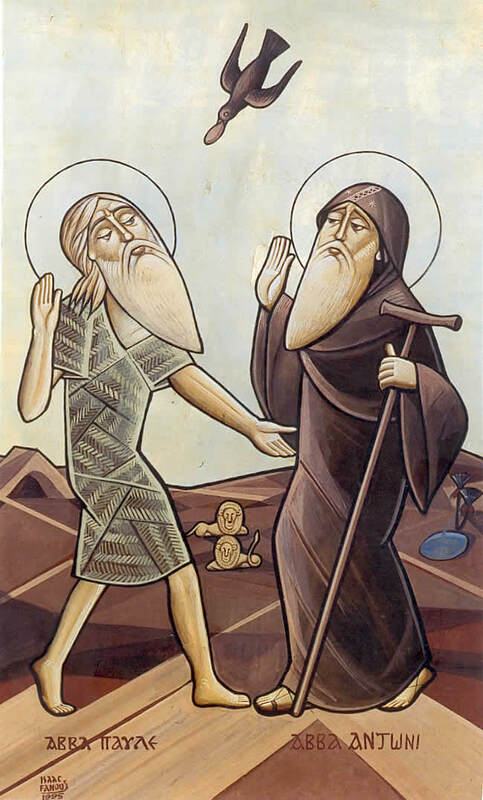 The great St. Anthony of the Desert visited him a little before his death and St. Paul asked him, as a last favor, to allow him to sleep his last sleep in the cloak of St. Athanasius, the invincible defender of the divinity of Christ. He thereby affirmed that he died in the communion of this saint and that his own long life of penance had encouraged those who fought against the Arian heresy. He died toward 342. During this season after Epiphany, consecrated to the manifestation of the divinity of Jesus, let us with St. Paul, the hermit, endeavor to convince ourselves that a Christian life consists in recognizing Christ as the Son of God and in sanctifying ourselves by making His divine holiness our own. Saint Maurus, O.S.B. (or Maur), was the first disciple of St. Benedict of Nursia (512-584). He is mentioned in St. Gregory the Great’s biography of the latter as the first oblate; offered to the monastery by his noble Roman parents as a young boy to be brought up in the monastic life. Four stories involving Maurus recounted by Gregory formed a pattern for the ideal formation of a Benedictine monk. The most famous of these involved St. Maurus’s rescue of Saint Placidus a younger boy offered to St. Benedict at the same time as St. Maurus. At Saint Benedict’s order, St Maurus ran across the surface of the lake below the monastery and drew St Placidus safely to shore. The just man shall flourish like the palm tree, like a cedar of Lebanon shall he grow: planted in the house of the Lord, in the courts of the house of our God. Ps 91:2 It is good to give thanks to the Lord, to sing praise to Your name, Most High. V. Glory be to the Father, and to the Son, and to the Holy Ghost. R. As it was in the beginning, is now, and ever shall be, world without end. Amen. The just man shall flourish like the palm tree, like a cedar of Lebanon shall he grow: planted in the house of the Lord, in the courts of the house of our God. O God, Who each year give us the joyful feast of blessed Paul, Your Confessor, mercifully grant that we may imitate the deeds of him whose anniversary we celebrate. Through Jesus Christ, thy Son our Lord, Who liveth and reigneth with thee, in the unity of the Holy Ghost, ever one God, world without end. R. Amen. May the blessed Abbot Maur plead for us, O Lord, so that through his intercession we may obtain what we cannot get by our own merits. Through Jesus Christ, thy Son our Lord, Who liveth and reigneth with thee, in the unity of the Holy Ghost, ever one God, world without end. R. Amen. Lesson from the letter of St Paul the Apostle to the Philippians. Brethren: The things that were gain to me, these, for the sake of Christ, I have counted loss. Nay more, I count everything loss because of the excelling knowledge of Jesus Christ, my Lord. For His sake I have suffered the loss of all things, and I count them as dung that I may gain Christ and be found in Him, not having a justice of my own, which is from the Law, but that which is from faith in Christ, the justice from God based upon faith; so that I may know Him and the power of His Resurrection and the fellowship of His sufferings: become like to Him in death, in the hope that somehow I may attain to the resurrection from the dead. Not that I have already obtained this, or already have been made perfect, but I press on hoping that I may lay hold of that for which Christ Jesus has laid hold of me. The just man shall flourish like the palm tree, like a cedar of Lebanon shall he grow in the house of the Lord. V. To proclaim Your kindness at dawn and Your faithfulness throughout the night. Alleluia, alleluia. Osee 14:6 V. The just man shall blossom like the lily, and flourish forever before the Lord. Alleluia. At that time, Jesus spoke and said, I praise You, Father, Lord of heaven and earth, that You hid these things from the wise and prudent, and revealed them to little ones. Yes, Father, for such was Your good pleasure. All things have been delivered to Me by My Father; and no one knows the Son except the Father; nor does anyone know the Father except the Son, and him to whom the Son chooses to reveal Him. Come to Me, all you who labor and are burdened, and I will give you rest. Take My yoke upon you, and learn from Me, for I am meek and humble of heart; and you will find rest for your souls. For My yoke is easy, and My burden light. O Lord, in Your strength the just man is glad; in Your victory how greatly he rejoices! You have granted him his heart’s desire. O Lord, in memory of Your saints, we offer You sacrifices of praise, trusting them to deliver us from both present and future evils. Through Jesus Christ, thy Son our Lord, Who liveth and reigneth with thee, in the unity of the Holy Ghost, ever one God, world without end. R. Amen. O Lord, we beseech You, may the offerings placed upon Your holy altar be beneficial for our salvation, through the prayers of Your holy abbot Maurus. Through Jesus Christ, thy Son our Lord, Who liveth and reigneth with thee, in the unity of the Holy Ghost, ever one God, world without end. R. Amen. The just man is glad in the Lord and takes refuge in Him; all the upright of heart shall be praised. Filled with heavenly food and drink, we humbly pray You, our God, that we may be helped by the prayers of him in whose memory we have received Your sacrament. Through Jesus Christ, thy Son our Lord, Who liveth and reigneth with thee, in the unity of the Holy Ghost, ever one God, world without end. R. Amen. O Lord, may the reception of Your holy sacrament, and the pleas of blessed Maurus, the Abbot, protect us; so that, aware of the greatness of his life, we may obtain the help of his intercession. Through Jesus Christ, thy Son our Lord, Who liveth and reigneth with thee, in the unity of the Holy Ghost, ever one God, world without end.